Cricket Wireless recently increased the amount of high speed data included with its $40 Basic Plan from 2.5 GB to 4 GB. This change adds 1.5 GB or 60% more data for the same amount of money. The nice thing about this plan is that Cricket also offers a $5 per month discount when you enroll in the automatic payment plan, auto-pay, where they automaticall bill your credit card each month for your plan. And because Cricket’s plan includes taxes and fees, the Basic Plan with 4GB will only cost your $35 per month. 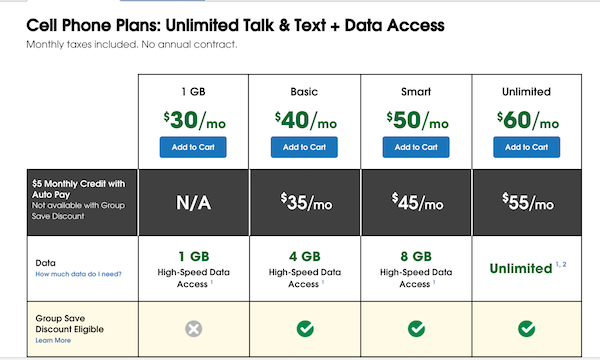 While the only the $40 Basic plan was updated in the last few days, I noticed the $60 Pro Plan which previously included 10GB has been eliminated and replaced with a $60 Unlimited Plan since I last reviewed Cricket’s Plans in January. The $5 Auto Pay discount also is available for this plan bringing the price to $55 per month. Not long ago, Metro PCS updated their plans and included their $30 1GB plan to 2GB of high speed data per month. Looks like Cricket has repsonded by making their $40 Basic Plan more competitive rather than updating their $30 plan. I you have read my previous articles and reviews you may know I switched my wife to Cricket’s 1GB plan back in January. She uses it with her iPhone and likes it. Cricket’s plans have a max download speed of 8Mbps but she doesn’t notice a difference over her old plan. Now even though $40 plan is $35, just $5 more for 3GB per month we aren’t going to change her plan. She won’t use that data and the additional $60 per year would pay for two moths more of service. Hi Bob I have a Straight Talk iPhone 5s and I was wondering if I could put it on the Verizon Network. I used my IMEI number to check my compatibility it says it works. But when I put my Verizon SIM Card in it kicks me out of my homescreen and makes me type in my Apple ID over and over. Do you have any advice. A couple more questions.. are you trying to use it with Staight Talk Verizon’s network or Verizon? Where did you get the phone and the active Verizon SIM? Look carefully, is it asking for your Apple ID or the Apple ID for a different email address? I haven’t tried activating a Straight Talk Verizon iPhone on Verizon myself, but others have told me they have had issues. If you bought the phone recently and at a discounted price it may be activation locked to Straight Talk. If possible, send me a screenshot of what screen you are stuck at. Do you still have the Straight Talk Verizon SIM, what happens when you put that SIM in the phone and then remove it and swap to the Verizon SIM?